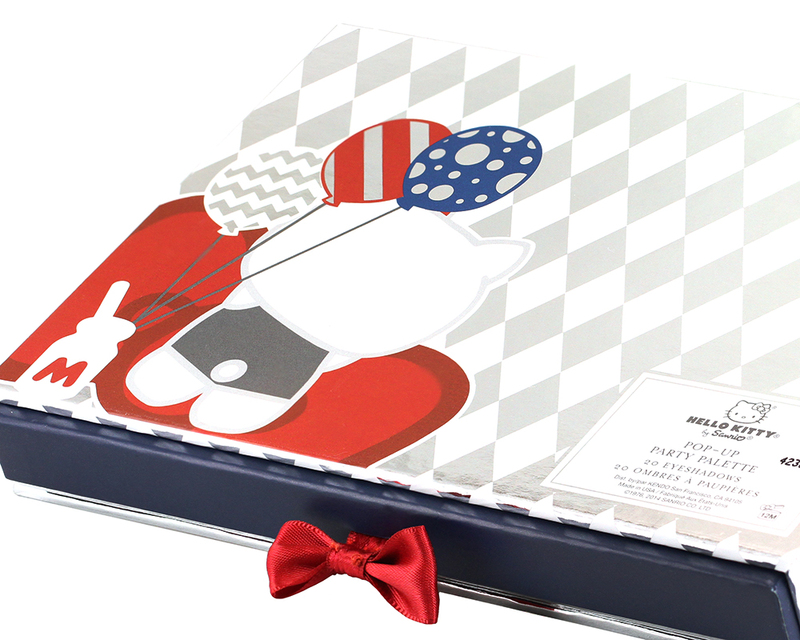 Today I have the last piece of the Hello Kitty 40th Anniversary Collection to showcase. I did save the best for last, didn't I? 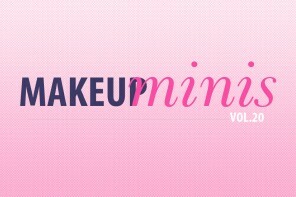 :D If you love wearing colorful eye makeup, you will want to keep reading! 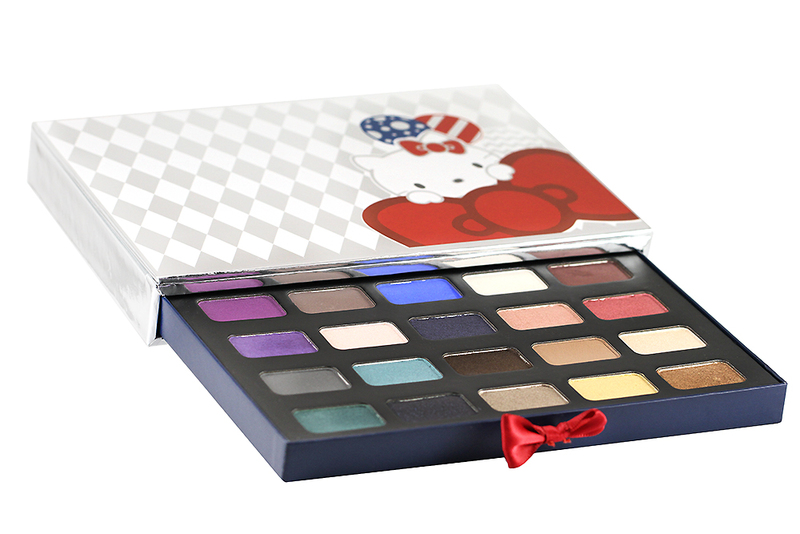 The Hello Kitty 40th Anniversary Pop-Up Party Eyeshadow Palette contains 20 richly pigmented eyeshadows ranging from neutral tones to bright, colorful hues. 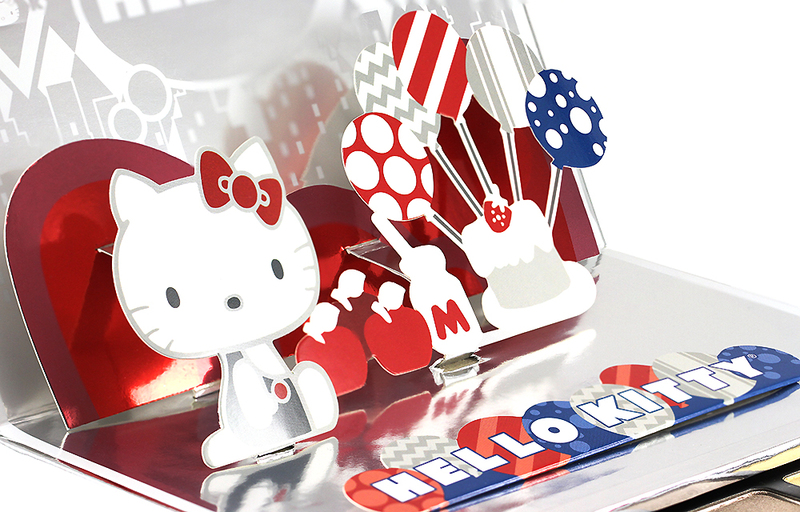 The top layer of the palette lifts up to reveal a super adorable 3D Hello Kitty Pop-Up Party art (replacing a mirror that you'd see in most palettes) and closes with a strong magnetic force, while the bottom layer is a drawer that you can pull out through a satin ruby-colored bow. The bow feels very fragile and I have a feeling it will break/fall off at one point because the drawer doesn't slide out easily. You will need to exert quite a bit of force to pull the entire drawer out if you want to see all the shadows at once. The top row of the shadows also sits very close to the edge of the top layer making it slightly inconvenient although the entire pans are still visible. The whole palette feels bulky in general but this is more of a collector's piece so convenience and portability may not be the first priorities when they envisioned the design of the palette. 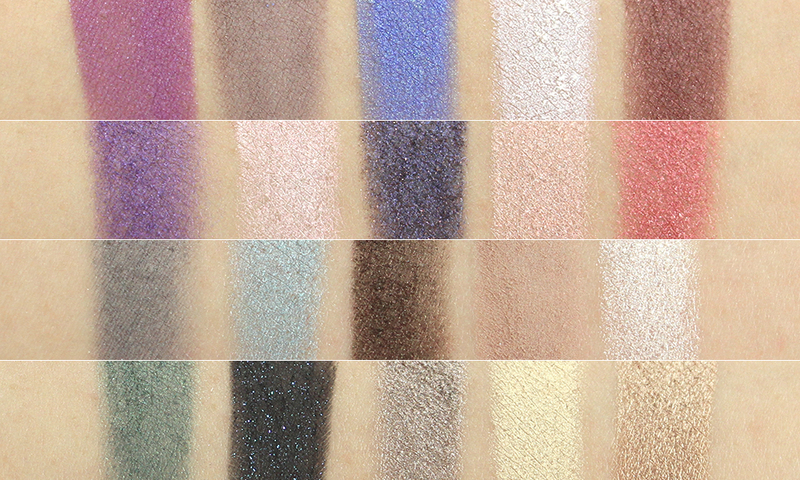 The eyeshadows are arranged in no particular order. It seems to be a random mix of neutral and bright shades. The shadow names are not printed on the palette but are displayed on the plastic insert and on the back of the box. There are some really unique shades that I have not seen anywhere else before such as the pastel yellow and the azure blue. 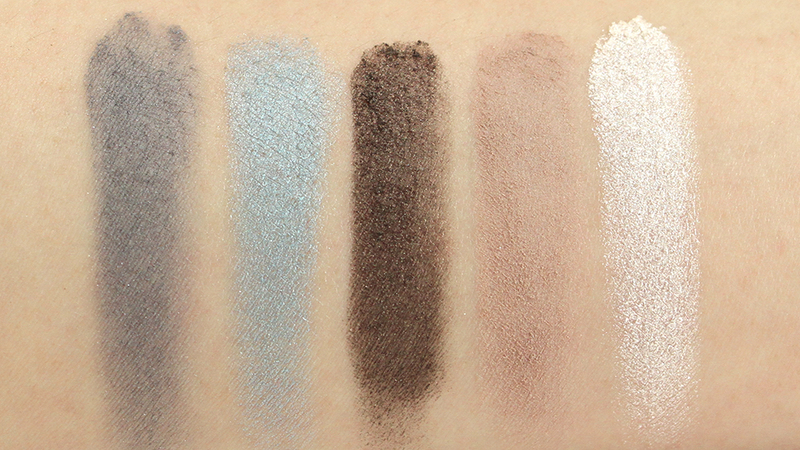 The quality of the shadows varies greatly between shades but I'll have to say that most of them are surprisingly creamy, velvety soft, and wow, very pigmented! I honestly did not expect the colors to be this vibrant and saturated at all. There is also a wide variety of finishes including matte, satin, metallic, shimmer, and a cross between satin and metallic. Although the shadows may seem to be of great quality at first but upon using them on the lids, some shades turned out to be quite a letdown. The problems I encountered were such that the pigments don't seem to adhere well to the skin and fade either immediately or too quickly upon the start of blending. The shades that contain sparkle are also prone to fallout. To improve the performance of these shadows as well as to prolong the wear, I find it best to apply them over a cream base or thicker eyeshadow primer and only blend as necessary with a more precise blending brush. What a beautiful shade of purple with that hint of plum! It has decent pigmentation but too bad the color fades and sheers out too quickly upon blending. It is also slightly powdery. 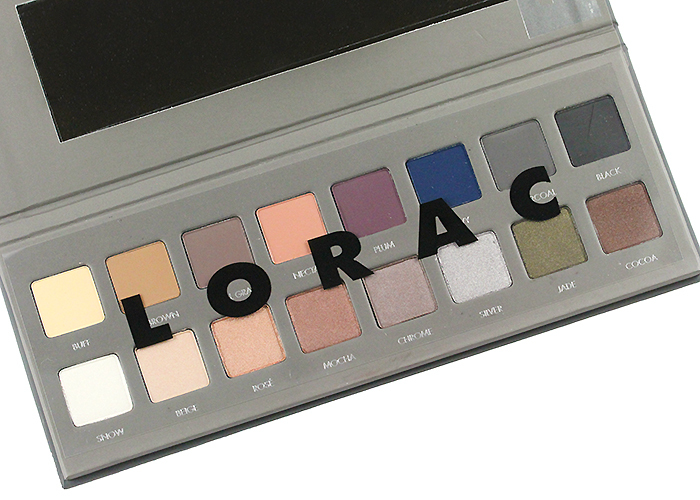 Fairly pigmented, creamy, and smooth. Doesn't feel chalky or powdery at all but it takes some time to blend to an even finish. The beauty of this color is the strong azure blue base with floating teal shimmer. The color looks so amazing in the pan but it performs poorly on the lids. The application looks faded, uneven, and patchy. This is not your typical white because it has a pink fluorescent quality to it. Quite unique actually! The texture is soft, buttery, and super pigmented! Rich color payoff, smooth and creamy, goes on opaque in one pass, blends well but perhaps too well because the pigment seems to fade and sheer out too much too soon. Another beautiful shade in the pan. The texture is nice and soft and leaves a slight metallic sheen on the lids. However, the formula feels a bit thin, fades quickly, and is difficult to blend. My favorite shade! It is a vanilla with the most beautiful pink-hued iridescent sheen. 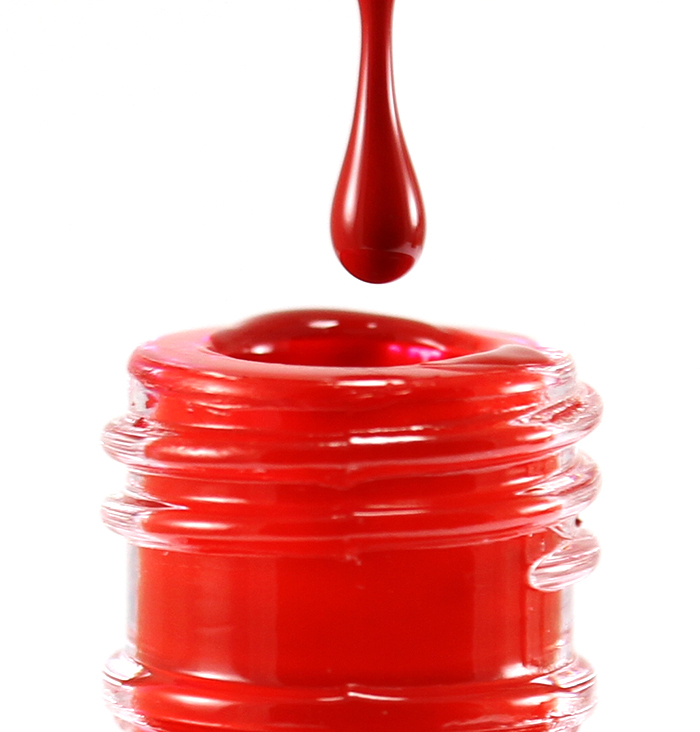 Rich color payoff, soft and creamy smooth with amazing blendability. 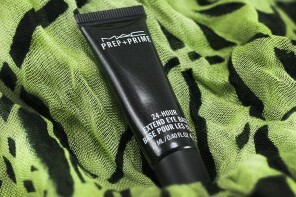 Incredibly pigmented and the color seems to adhere to the skin well without diluting too much during blending. The texture feels smooth for the most part but the high glitter content leads to some fallout during and post application. Very nice color for all over the lids. The texture feels smooth with a nice color payoff. Very easy to blend to a nice and even finish. 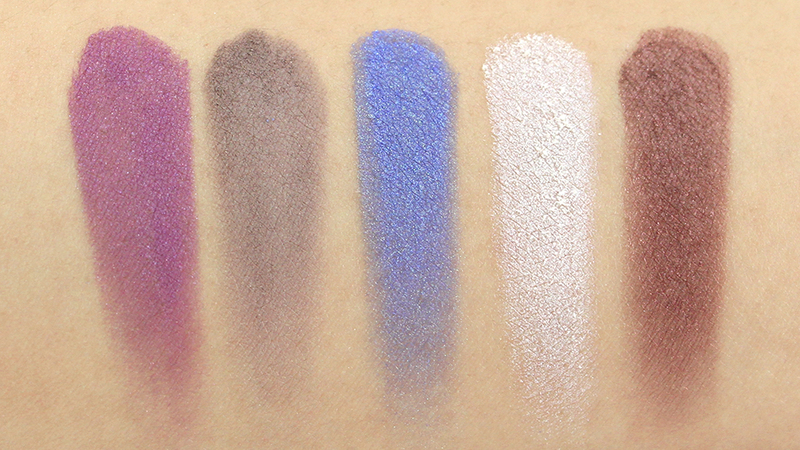 This one is incredibly smooth and pigmented! And with a beautiful, slight metallic sheen! The color goes on opaque in one pass. It also blends really well and doesn't fade too much during blending. What a beautiful gray but the application is prone to deliver a patchy, powdery, and uneven finish. Decent pigmentation but tends to fade quickly. Doesn't adhere well to the skin and needs to be packed on for a nice color payoff on the lids. Such a pretty teal, such a shame. This one is the BEST performer which has the BEST formula. It is ridiculously buttery smooth, seriously! 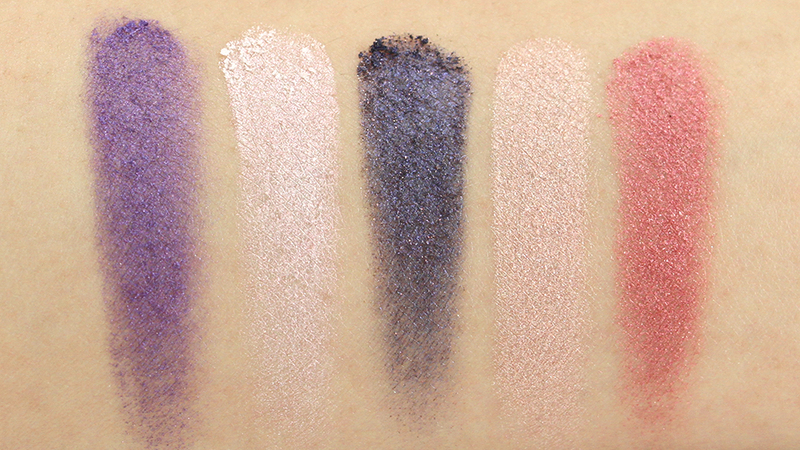 And the pigmentation is beyond incredible — rich and saturated, and it's just so easy to blend to a nice smokey finish. Love this shade! This shade is such a flop next to the best performer. It is very, very sheer, almost invisible on my skin. It also feels chalky and powdery. Another amazing highlighting shade. 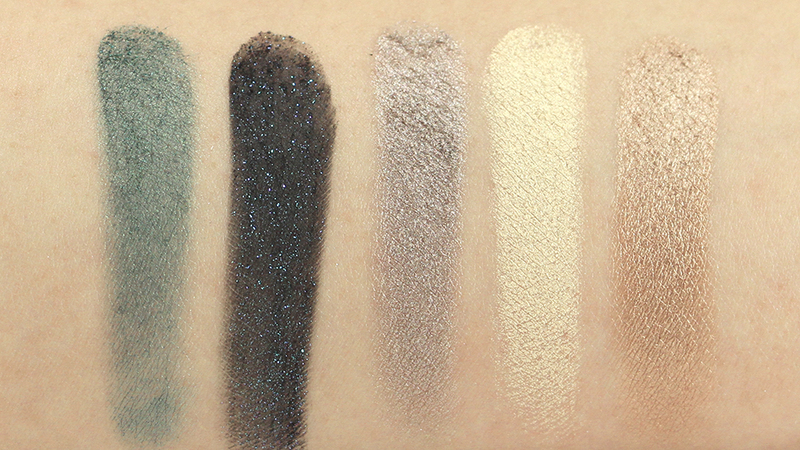 It has decent color payoff and the shimmery effect is very beautiful. Blends nicely but also sheers out quickly. One of the most beautiful forest greens I have come across! 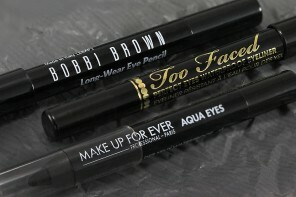 Blends very well, too, but again, it fades quickly just like most of the shades. The texture is soft and smooth, though, and leaves a nice, soft metallic finish on the lids. Such an interesting shade! It is a super pigmented and saturated black but the green sparkle seems to cause some serious fallout. It also takes extra time to blend to an even finish but at least the intensity doesn't seem to dilute quickly. This one is a nice metallic taupe with amazing texture; soft, creamy, opaque, and buttery smooth. Blends really, really well, too. A great all-over-lid color. What a unique color! However, the application is disappointing as it doesn't stick to the skin at all. 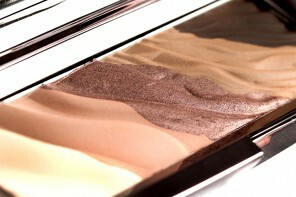 It also feels powdery, chalky and is very difficult to blend. 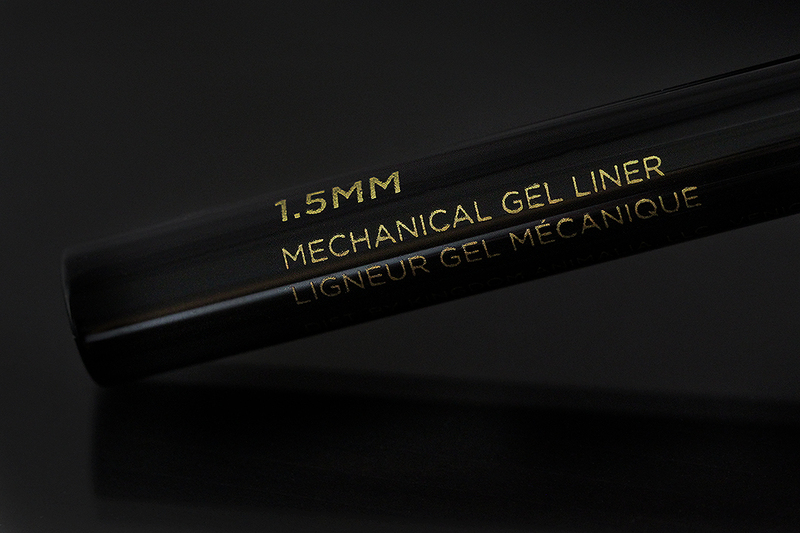 Smooth, buttery soft, incredibly pigmented and opaque. A 5-star formula for this shade! Plus, it is such a beautiful metallic bronze that blends superbly! For this very simple look, I only used 4 colors! 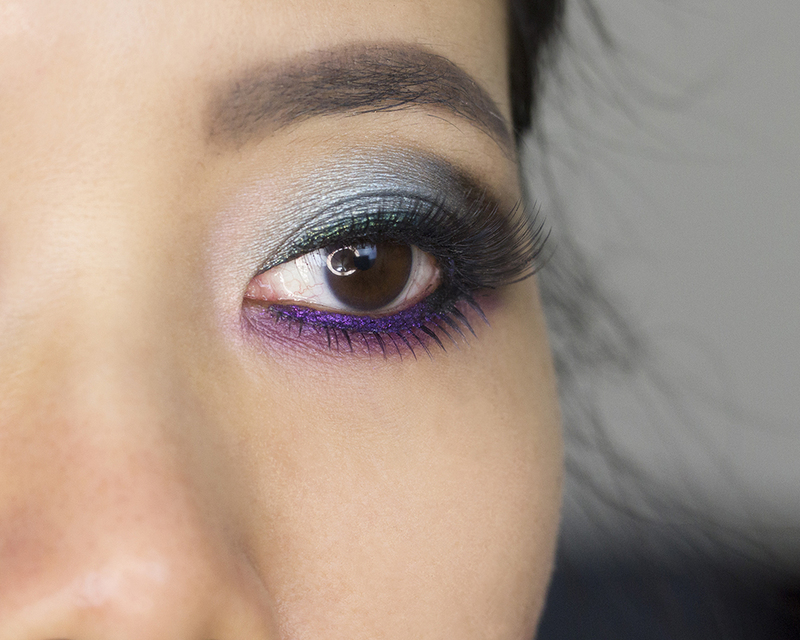 :) I applied Kawaii as a lid color and darkened the outer corner with The Original. The highlighting shade in the inner corners is the beautiful iridescent Friendship blended into Happy along the lower lash line. 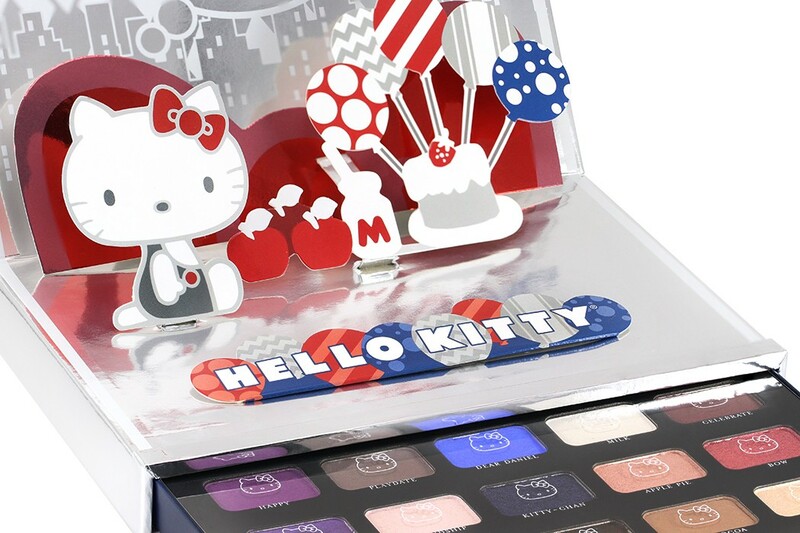 Disclosure: The Hello Kitty 40th Anniversary Pop-Up Party Eyeshadow Palette was provided by Sephora. All opinions are my own. 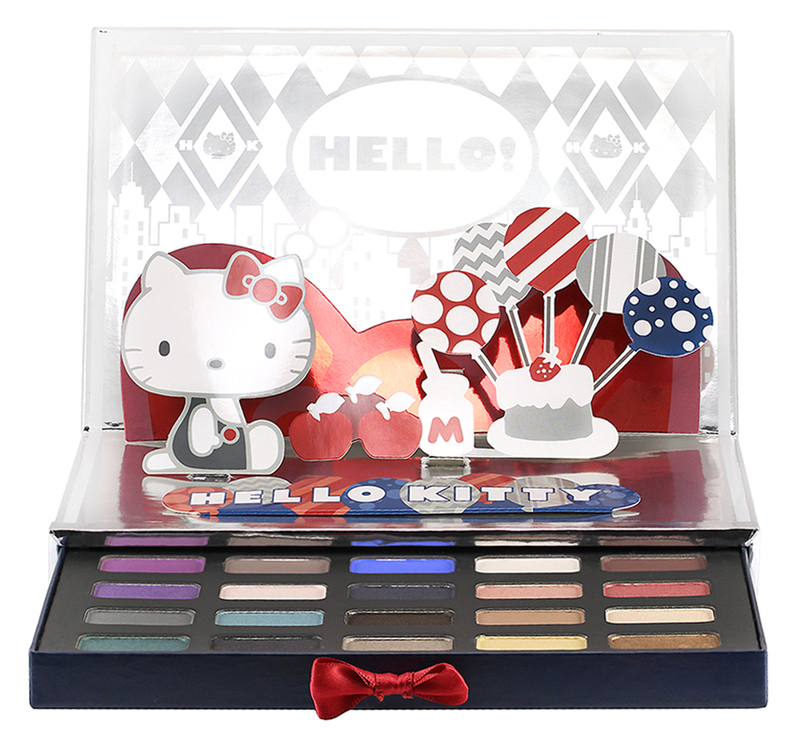 This would make such a great present for a teenager who has just started getting into makeup, or a Hello Kitty enthusiast for sure! As usual, love the amazing look you came up with, Jaa! Thanks, Sunny! As I age, I thought I’d grow tired of Hello Kitty… apparently not. LOL. I normally don’t go for super cutesy items, but this is a great palette and has a nice mix of brights and neutrals! I’m sad to hear that there are some performance issues, though! 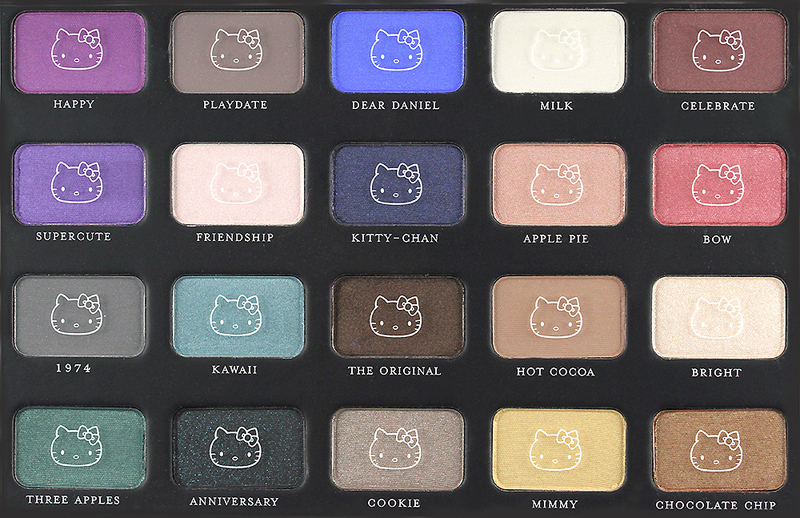 This whole palette is so cute! I like many of the colors, and like Hello Kitty. Cookie and Celebrate are what I was drawn to immediately when looking. 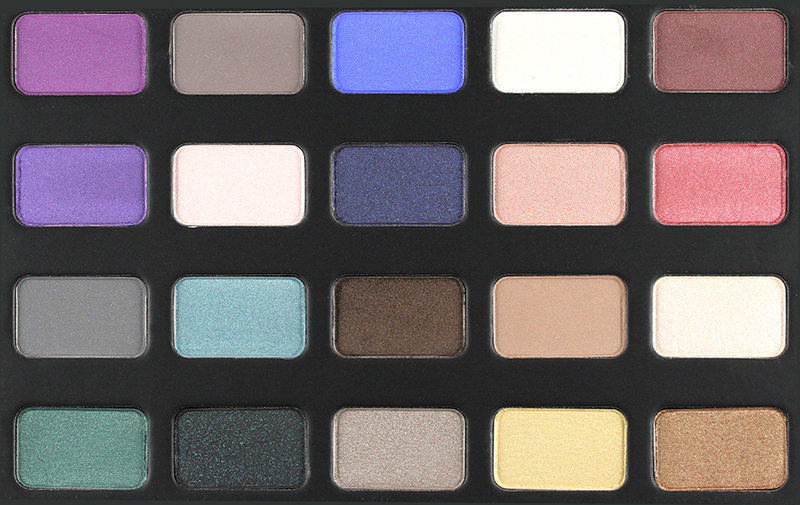 Such a cute palette! I too still love HK and doubt that will ever change! 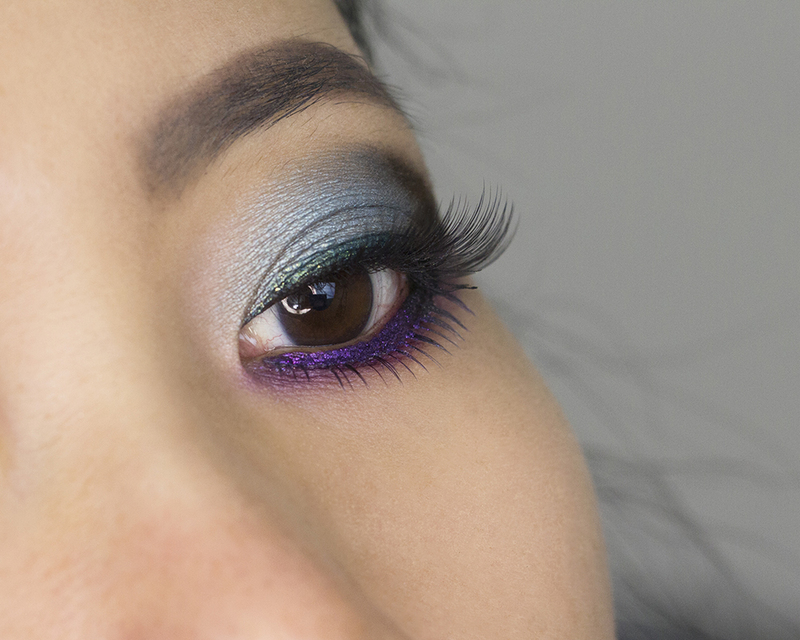 Lovely eye look you created – so fun and colorful, Jaa! Woah, this is such a cuuuuuute palette! I had no idea they had amazing make-up like this, especially for Hello Kitty, except those children’s play make-up. And I looove the look you made with it! Thanks so much, Olivia! 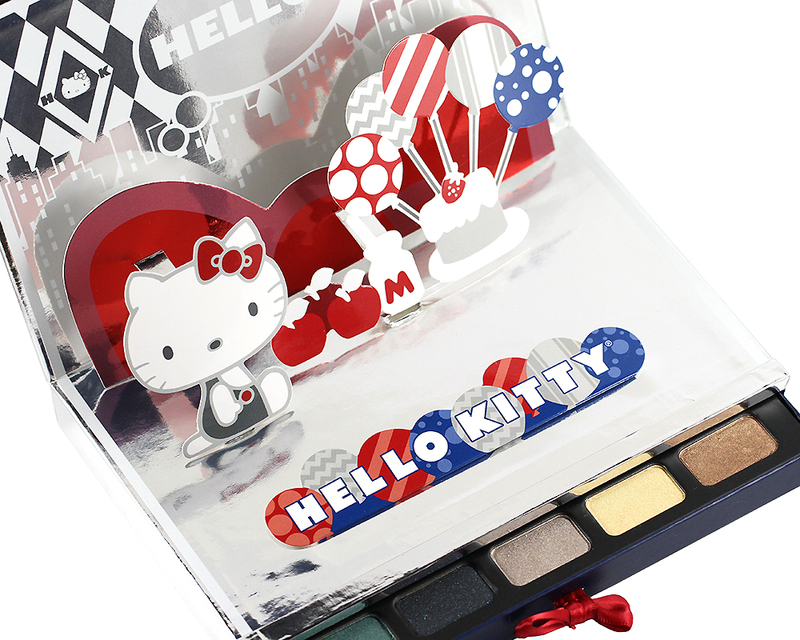 The quality of Hello Kitty 40th Anniversary Collection makeup is surprisingly good! 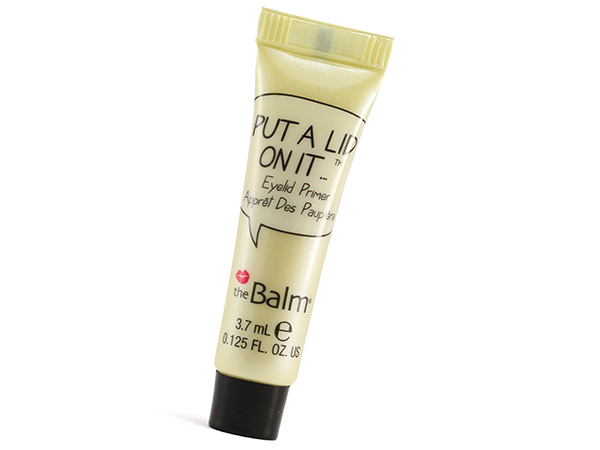 Have you tried the lip balm trio set? They are CRAZY pigmented and super moisturizing! :D I didn’t expect that at all! I’m genuinely in love with the unusual shade selection, but it’s such a shame the quality isn’t as impressive!! Maybe it’s because I’m not a *huge* fan of Hello Kitty (Keroppi all the way, yo’), but I think I’d need the shadows themselves to be more awesome. Still, holy cow at what you managed to do with them!! O_o The eye look is so gorgeous >_< GIVE ME YOUR SKILLZ! I've said it before, but I'll say it again! LOL thanks, Syl! You have MAD skillz yourself, yo’! 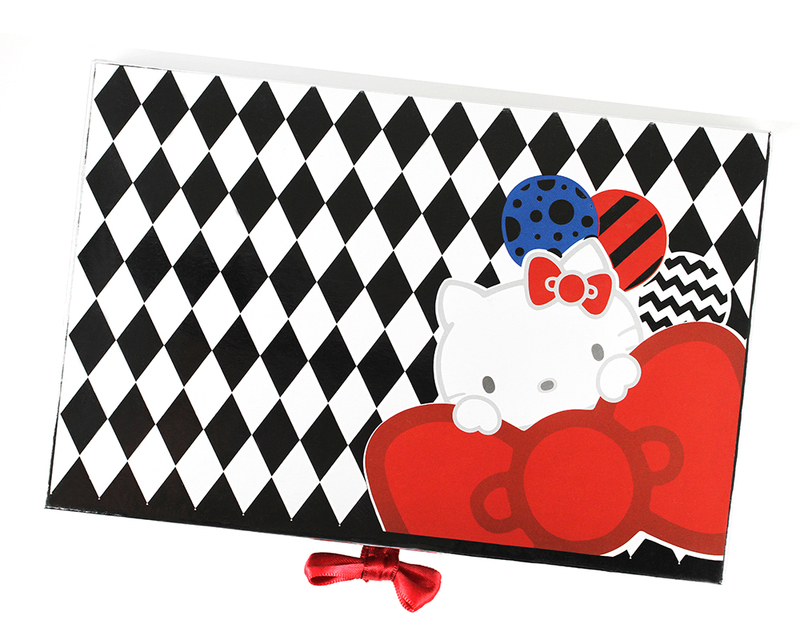 I purchased this palette almost as soon as I saw it but I’m a Hello Kitty collector (hoarder). lol I’m in love with the whole thing. Thanks for the detailed review on each shade! Anytime! I love reviewing eyeshadow palettes! So much to talk about and I get to create all kinds of cool looks! :D How do you like the palette so far?